Please click here or visit our FaceBook for album pictures. 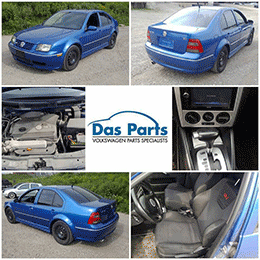 We have in for parts a gorgeous totally rust free extremely clean Mk4 GLI this week at Das Parts. This car is an insurance write off due to light damage to the front lip and radiator support. The car is completely stock with no modifications. The entire exterior is in near perfect condition with the exception of the broken front lip. The car runs and drives as well as brand new. No flaws at all with the engine or transmission, and no codes with either. The interior is in very good shape with all the GLI bits in very good condition as well. Really nothing bad to say about this car. Please contact us for pricing inquiries and parts availability.